Concrete floors are often considered drab and unappealing choice. The reason for such connotation is pretty obvious if not completely justified. Hearing ‘concrete’ an average person quickly imagines vast expanse of grey, dull substance that can be encountered in warehouse or home improvement center. Yet, modern concrete floors can be much more with their different cuts, various textures and multitude colors. Knowing that concrete proves quite esthetic flooring choice, you want to know, how much you would pay. As with any other home improvement undertaking, there is no one rigid price tag and you have to include several aspects in your calculations. Usually bigger concrete floors are more expensive as they require more materials and time. 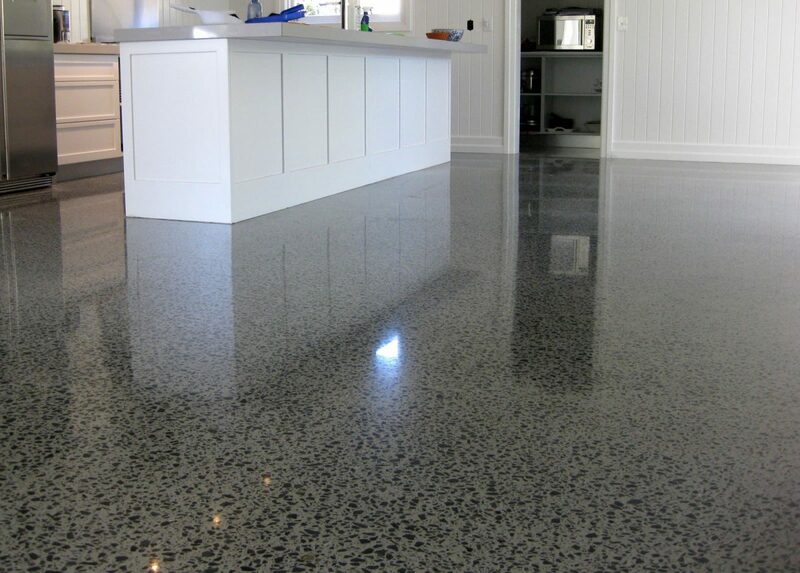 But square footage of the interior doesn’t determine the ultimate cost of polished concrete floors. If any given area has atypical layout and / or is difficult to access (which often applies to small rooms) then the polishing have to be done by hand and thus be more expensive. If you aim for more elaborate concrete floor then be ready for higher bill. For basic, one layer polished floor, you’ll pay anywhere from $2 to $6 per square foot. Slightly more complicated project with scoring and more than one type of staining will cost $5 to $8 per square foot, while intricate designs, elaborate patterns, advanced coloring and stenciled polishing will cost $8 to $15 per square foot. That’s probably single the most important factor determining concrete floor cost. Level of grinding is in direct relation to future sheen of your floor, so contractor has to estimate beforehand how many times he’ll need to grind material to achieve desired effect. On average total cost of concrete floor is around $2,000 but can be as high as almost $4,000 or as little as $1,500.